Only some of Clint's sheep look alike. He selects based on profit rather than looks. In order to know your profit, you have to keep excellent records. That is how Clint Auderer runs his commercial sheep farm and feedlot outside Holy Cross, IA.Last year he lambed out 60–65 ewes and fed out 600 feeder lambs that he purchases direct. Clint maintains scrupulously detailed records of the sheep that come onto his farm in order to best maximize profit potential. To determine a ewes profit, Clint combines every variable that influences profit in to a single number that he calls the Profitability Index (PI). The PI is the amount of profit that a ewe is generating in the current market. When a ewe ceases to generate profit, she is culled. All of this information is input into Clint’s self developed software (he spent a number of years as a computer programmer). The software also models price of lamb and feedstuffs to aid marketing and culling/retention decisions. The data and software enable Clint to know each ewe’s profit and potential profit based on the ewes to-date performance and historical data for sheep of a similar type (breed/cross). However, during years when the market conditions are poor (ex. this year) and profit is lacking, he looks at lifetime production. Ewes that are producing 285 lbs or more have tenure. Clint's ewes were kind enough to pose for this photo. From May-Dec they are on pasture with no supplementation (except for flushing). The commercial flock is a mixture of Polypay, Romanov and East Friesian though there are a few ewes with Suffolk, Dorset and Columbia genetics. His preferred breed or cross is not set in stone because the most profitable ewe or ewe cross is not the same year after year. One year it may be a Suffolk cross ewe with the best PI or it may be a Polypay Cross. 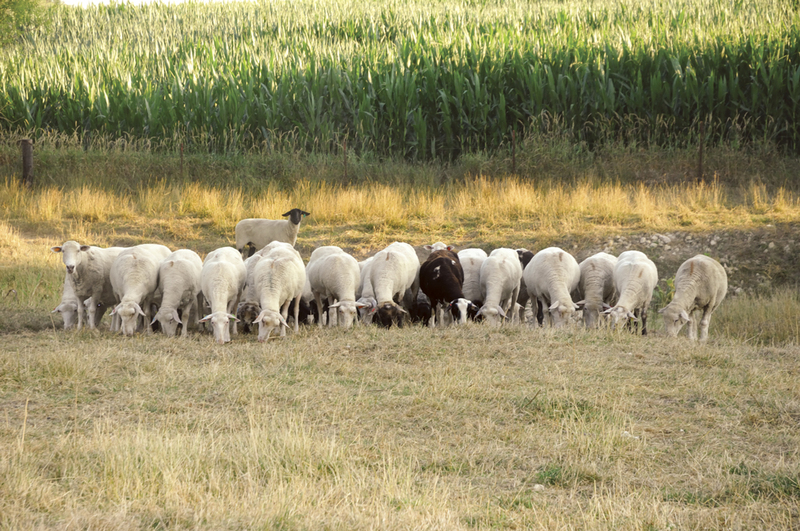 Ewes are bred in the fall, lambed in late March/early April and are on pasture from May to December. Clint’s 5-year average finishing rate was 1.89 lambs per ewe wintered. This figure includes all open ewes, ewes who lost their lambs and ewes that may have died. The rate for ewe lambs was 1.34 lambs per ewe. Clint took on 12 feeder lambs from a neighbor. These were the only feeder lambs he bought for 2012. Ear tags and detailed records allow Clint to know the performance numbers of the lambs on his farms. Based on weights and calculations he can determine the day they should be finished/most profitable. Feeder lambs are fed a corn, corn gluten, soybean hull and protein pellet ration. Clint mixes his feeds based on the NRC’s 2007 Nutrient Requirements of Small Ruminants. Lambs are fed with self feeders. This allows the animals to have access to feed even when Clint is at his off-farm job as a mechanical/structural engineer for John Deere. Though the lambs are on self feeders, Clint has noticed minimal feed waste. He credits this to using a whole corn ration when they reach a specific age. To determine where the lambs are in their growth, Clint weighs lambs at weaning (60 days of age), 100 days and one week before they are ready to head to the packer. To determine the latter, he uses the Grompertz formula for growth. This formula takes the 2 previous weights and predicts an animal’s weight based on the growth curves from previous years. Using this data, Clint determines when the lambs are most profitable, at which point he sells. 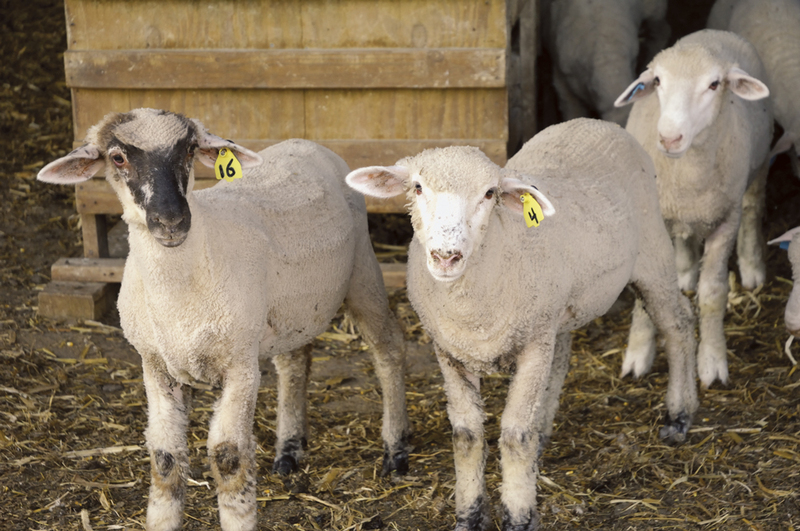 Lambs are typically ready at 180 days and are sold directly to a packer or packer buyer. The lambing jugs and the grinder/mixer. The long auger allows Clint to reach deep into the barn to fill feeders. 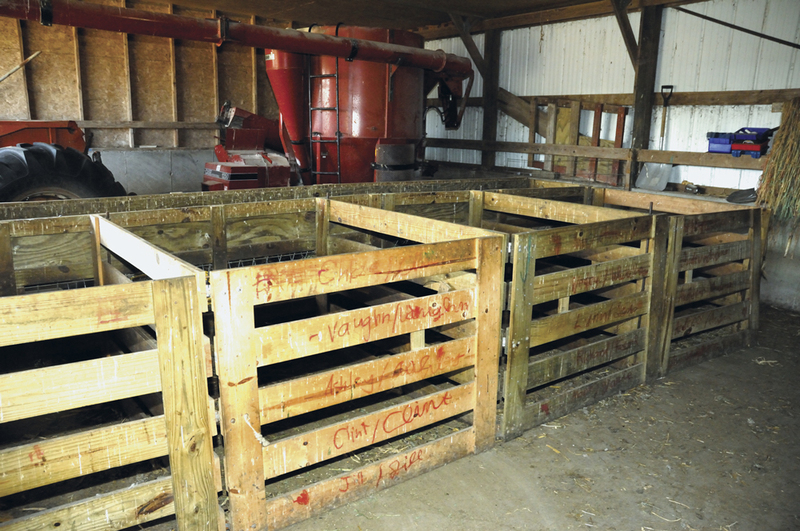 The lambing jugs are built into bunk feeders for efficient feeding. Clint prefers to buy uniform groups as it makes determining rations and predicting growth more accurate. In May he buys lambs in the 50–60 lb range, June 60–90 lbs and October 65–90 lbs. When lambs come onto the farm they are on a hay/grain mix for a few weeks until he increases the grain and reduces the hay. Last fall a new barn was built for wintering/lambing ewes and feeding out lambs, but this summer it sits empty. When the time for buying lambs came around, lamb prices were on a downward trend while corn prices were going up. Clint made the decision not to buy feeder lambs. He looks on the bright side by saying that he would likely not be profitable this year if the barn was full of lambs on feed. How do the lambs taste? Each year he has a few of his own lambs processed for home consumption and he can tell you that they do in fact taste excellent. So not only can he find ways to make sure his flock is profitable, he can also produce a top shelf product. Clint maintains a website http://www.auderersheep.com/ where he shares details on his operation.